The other the Campus Superstar contestant. Their relationship? Uncle and nephew. Ha! So ~qiao3 right? Always on MSN talking nonesense (according to his mum)… ha! 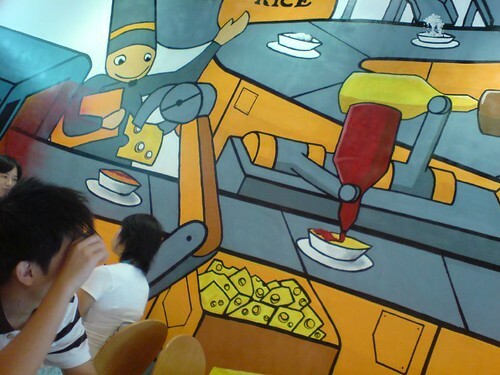 The picture on the wall was painted by weiqi from superband. are u sure he was your classmate? he looks 10 years older than u are! Aiyoooo… Sure or not? Hahaha… OK, confirm you look very young! Erm… How old are you ah? From here i can see something! that means Rong Shao Ye is not young anymore!!! haha!!!! Anyway joking lah!!!! The fans of Rong Shao is going to bash me up… hehe!! zomg, you were at simei! huhhhhhhhh haha so near my house! dasmond… u deleted all the other comments and kept those that said you look young!! hahahahah. ok sorry, i just found it amusing. >. rong sao look more young..
OMG! That’s your classmate? I think you look much younger than him. emo – there are some comment I dun think it’s appropriate to be posted. Normally I’ll answer it thru email. U shld’ve seen my reply if the email add u type in is a genuine one. Thx..
you were @ east point??? I planned to go to POSB to settle something that day! [email protected]#%$ I should have go lah! Then might heng heng see you. haha. nevermind! wish myself better luck next time! haha. btw dasmond, i’m ur secondary’s teacher….not,actaully ur classmate too….hahaha. most prob u ‘ll never remember who i’m but i also cannot remember who the “uncle” is ??? but look darn familiar…., must flip yr book to find out… 🙂 anyway i also look like uncle, so confirm u look young.